Well, it's here! Second Hand Heart has been in stores in the UK since Thursday. The blog reviewers have been wonderfully positive in their reception of the book (I just added a big bunch of review quotes to the Second Hand Heart book page) and I'm already beginning to hear from readers. That's what makes this all worthwhile. A quick note for those of you who are reading the book, are just about to read the book, or who have read it. On the Second Hand Heart book page, I have some original photos that I took myself. You see, Vida and I have been to some of the same places. 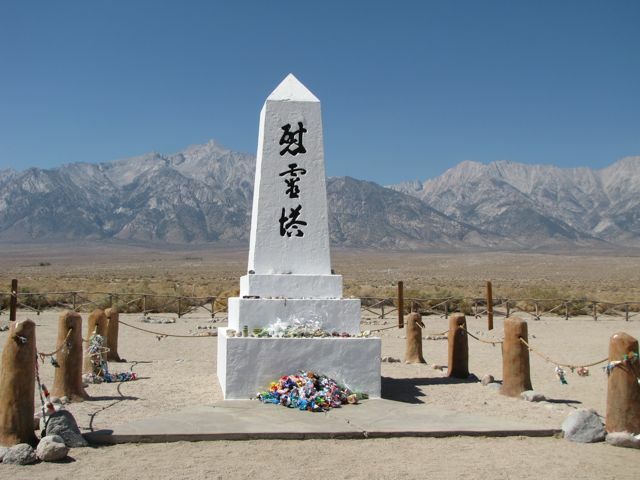 The photo you see here on this blog is the memorial stone at Manzanar. The one Vida visited with Victor and Esther (and Jax). But I also have a photo of Mt. Whitney from Whitney Portal, another looking down at the Portal Road, and one of the world's largest thermometer. I also have a little video I made of the view from the North Rim of the Grand Canyon. It's all on the Second Hand Heart book page. While you're there, take a look at the review quotes. And please do drop me a line and share your thoughts on the book.